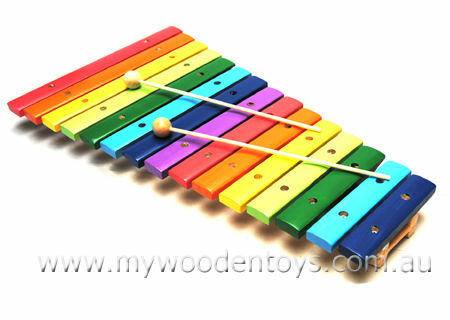 Wooden Xylophone Fifteen Tone Coloured is a fifteen note multi-coloured musical instrument with a lovely tone. This Xylophone is a toy but has been tuned so each note progresses up or down from the one next to it. A lovely wooden toy this xylophone is well finished. The Xylophone comes with two wooden beaters and has a lovely gentle pitch. Size: 42cm long, longest key is 23cm. We like this because: "A really good sound."